Indulge your senses at our premier Lakeside Spa and Salon, Mackinac Island’s only full-service health and wellness retreat. 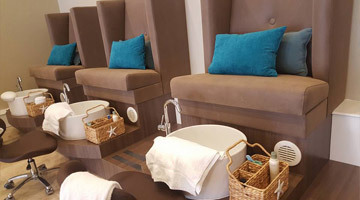 Highlights include a full hair and nail salon, multiple spa treatment rooms including a couple’s treatment room, men’s and women’s saunas and steam rooms, Aveda products and so much more. A perfect retreat while you visit Mackinac Island. Looking to treat someone special in your life to an experience they will never forget? Treat them to a day at the spa. Allow us to pamper them with hot stone massages, soothing pedicures, facials and body treatments. Located at Mission Point Resort, Lakeside Spa and Salon offers overnight packages that can be added to any stay for an additional fee. You can even reserve and pay for treatments in advance as a gift for someone staying at the resort – a great gift idea! Now taking reservations for the 2018 season for bridal parties and large events. If you have an event planned on Mackinac Island, make Lakeside Spa and Salon a part of your experience. Customized menu options for larger groups are available upon request. Be sure to connect with our coordinators.